Getting bikes, signing papers, meeting team and welcome dinner in the evening. Half a day walking tour plus small preparations for the tour. This day we also exchange money, buy local sim card, pack luggage and other staff. Team dinner in the evening. 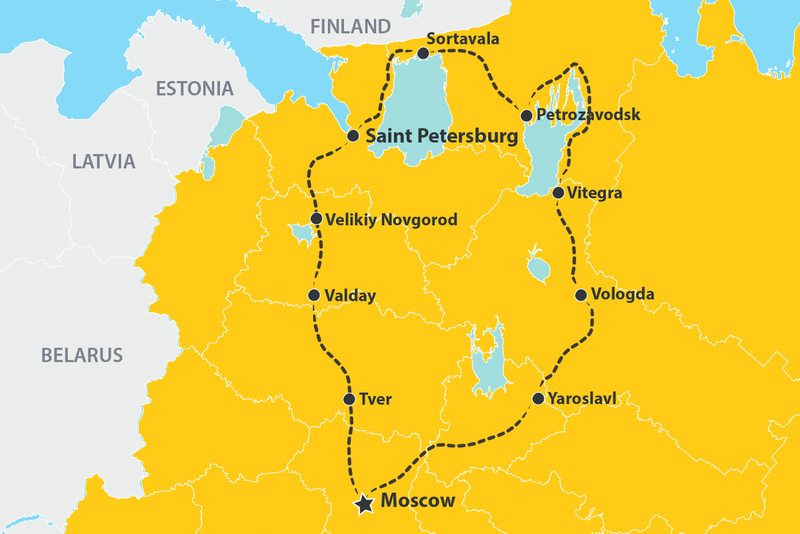 With secondary roads we leave Moscow and ride to the Valday National Park and Seliger Lakes. Today after a big city we have some rest in the national park. More secondary roads, small villages and towns. In the end we reach Novgorod, one of the oldest cities in Russia, which is 1155 years old. We walk to the Kremlin and after have a dinner at one of the restaurants on the bank of the Volkhov river. Saint-Petersburg is one of the most beautiful cities in the world. Marvelous palaces, churches and cathedrals, small streets and canals, Neva river and Baltic Sea. We reach the city and go for a city tour. In the evening dinner in Vodka Museum. Full day city tour. We visit Peterhof, Hermitage, Savior on Blood Cathedral and many other sights. Free time in the evening. Heading to the North we will reach Karelia Republic today. There will be 5-7 km of gravel road and after that fantastic 70 km of roads with ups and downs, turns and great views. Today we stay in Sortavala in the hotel complex on the Ladoga Lake. If the weather is good we make a boat trip to Valaam Monastery. Russian sauna and tasty dinner in the evening. One more great riding day to the capital of Republic of Karelia. Today we will reach Petrozavodsk and straight from the bike just into the boat to see Kizhi, a unique wooden museum complex in the middle of another big lake with old wooden houses and churches. Late departure and road to Vitegra, a small town where tomorrow we will have a rest day. In the evening we cook Russian BBQ and have free time. Half a day city tour, free time in the evening. Heading back to Moscow in the last days we will visit several cities of the Golden Ring, for example Vologda. A traditional small town with very quiet way of life, small streets, old buildings, cozy restaurants and nice people. Yaroslavl is considered to be most beautiful city of the Golden Ring. All of its center is considered to be UNESCO Heritage site. In the last riding day we reach Moscow making plenty of stops on the way in different towns along the Volga River. In Sergiev Posad we stop in a famous Sergieva Lavra.